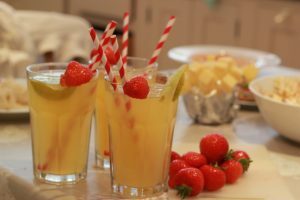 If you’re planning a family football party to cheer on England in the world cup take a look at my top 10 football party foods for a little healthy inspiration. So often nutrition takes a back seat at parties and celebrations but it’s easier than you think to make healthy food exciting and tasty and you don’t have to spend days preparing it. 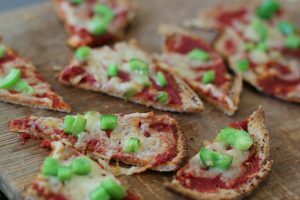 Pitta pizzas. Open up a pitta bread, toast it slightly so it becomes a little crispy then spread with tomato puree and top with your favourite toppings such as cheese, peppers, ham and mushroom and grill for 4-6 mins or until the cheese had melted. Cut into small triangles for a bite sized yummy snack. Bread sticks and vegetable crudités. Perfect for dipping these healthy snacks are a good alternative to dipping crisps. Choose different coloured vegetables such as yellow & red peppers, carrot and cucumber sticks to create a colourful party spread that provides a variety of vitamins and minerals and will help everyone achieve their 5-a-day. Hummus or salsa for dipping. For something to dunk those crudités into hummus or salsa are great options. Why not have a go at making your own hummus – it’s easier than you think! Whizz up 1 can chickpeas, 4 tablespoons olive oil, 1 garlic glove, 2 tablespoons of lemon juice, 2 tablespoons tahini and 2 teaspoons paprika in a food processor. That’s it! 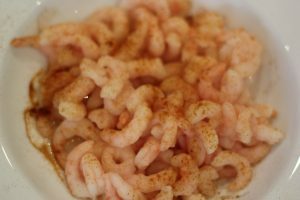 Paprika Prawns. Packed with protein, iodine, zinc and Omega 3 this is one of my favourite fast foods for parties. Simply sprinkle on some paprika for added flavour and voila; you have a tasty and nutritious snack which is great for boosting children’s brain performance –perfect for explaining the offside rule to the amateurs! Cheese and Pineapple sticks – to support England with a quintessentially British snack it’s got to be the cheese and pineapple stick. No party is complete without it! Crunchy Chicken Bites. 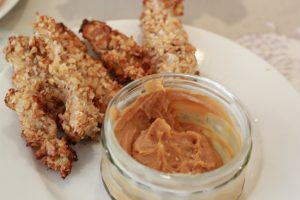 These nutty chicken bites provide plenty of muscle buidling protein. Ideal for those budding footballers! 175g/6oz chopped nuts (I used chopped walnuts as I had them in the cupboard already, you can choose whatever nuts you prefer). Make sure the nuts are very finely chopped, larger chunks and whole nuts can be a choking risk for little mouths. Dunk the chicken breast strips in the mixture. If you have time; cover the marinating chicken and leave for at least 30mins in the fridge or overnight if you’re super organised. If you’re like me and have hungry children waiting give the chicken a quick coat in the marinade and get cracking! Mix the chopped nuts with the coconut on a plate and coat each strip in the nutty mixture. Sweet Potato Wedges. Forget the fries, roasted sweet potato wedges will give your little footballers plenty of energy and with lots of vitamin A to support eye health they won’t take their eye off the ball! Fruity cones. This healthy alternative to ice cream is perfect for cooling off at half time. Mix a tub of low fat natural yoghurt with 2 tablespoons of low fat soft cheese. Add a selection of your favourite chopped fruits (we used cherries and strawberries) and give it all a good stir so your yoghurt mixture becomes rippled with the fruit. Pop it in the freezer at the start of the match and by half time it should be nicely chilled and slightly solid. 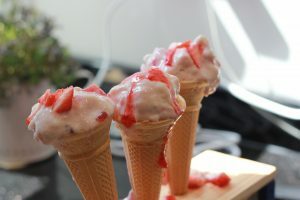 Serve in cones or bowls and garnish with a St George’s cross using finely chopped or pureed strawberries. Banana Pops Another simple sweet treat that can be knocked up in minutes. 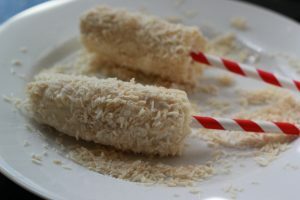 Cut a banana in half (or thirds if it’s a large banana) cover each piece in natural yoghurt using a pastry brush then roll in desiccated coconut until fully coated. Push an ice lolly stick into one end and serve. The kids can even do this one for you – winner! If it goes to extra time this tasty, wholegrain snack will help calm the nerves. 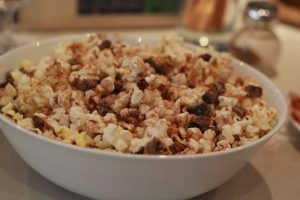 Pop some plain popcorn in the microwave or the pan. Once cooked sprinkle on some cinnamon and chopped dates for flavour. Another great snack to make with the kids. Water and milk are the safest drinks for teeth but if you fancy something a bit different try diluting pure fruit juice 50:50 with water (for children under the age of 5yrs the dilution should be 1:10), add a slice of lime and a strawberry for extra fun. Who could resist? 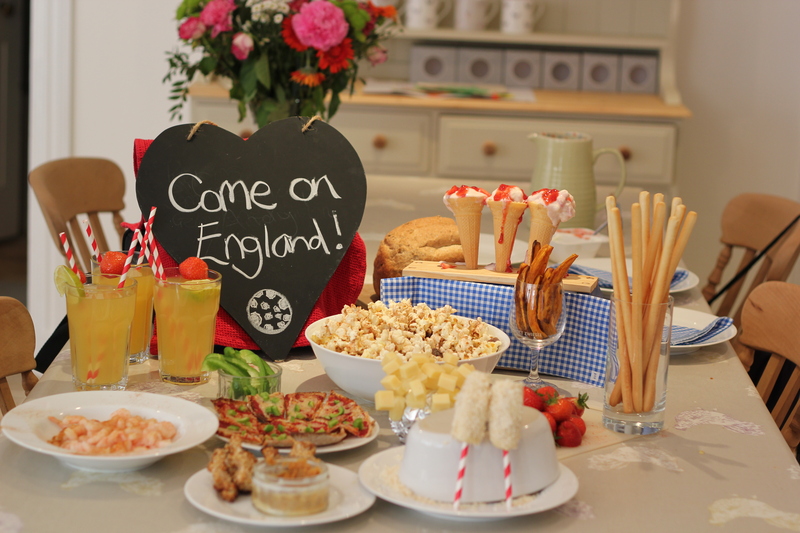 Now you have the party food sorted you can sit back and enjoy the match and whether the football produces cheers or groans these tasty healthy snacks are bound to get lots of applause!